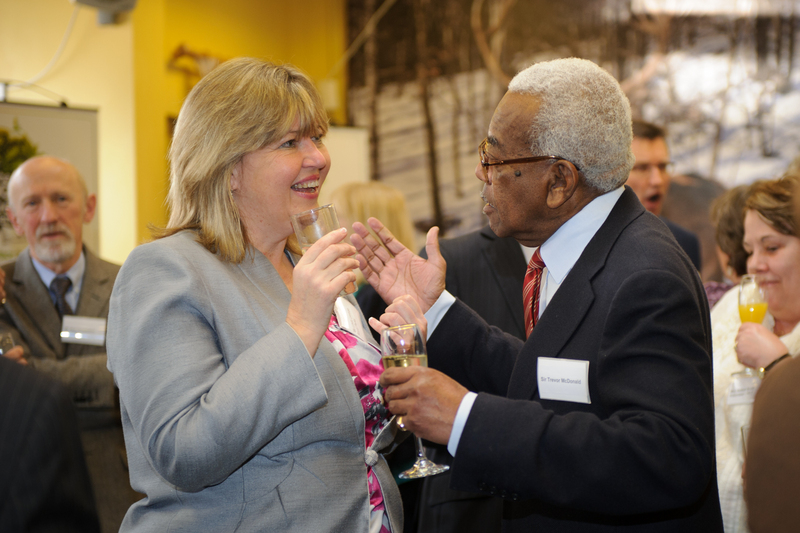 Television presenter Ben Shephard and TV Personality Sir Trevor McDonald along with The Royal Parks Chief Executive Linda Lennon CBE were amongst the guests celebrating 20 years of the Holly Lodge Centre in Richmond Park. Lennon congratulated Founder and retired Richmond Park Superintendant Mike Fitt OBE and Dr. Pat Ealey MBE for their dedication and hard work in the realisation of an idea which Fitt sought to make happen back in 1991. Patrons Shephard and Jem Sharples from Tenors Un Limited along with supporter McDonald raised a glass to the success of the Centre which provides people of all ages and abilities the opportunity to learn. Located to the North of Richmond Park, the Centre has been operating since 1994 and has become a thriving school resource to both Richmond borough and as a special needs resource to communities from much further afield. Schools, day centres, holiday clubs, hospitals and many other kinds of organisations are catered for and activities range from art, gardening and photography to environmental and historical interpretation programmes which are linked to the National Curriculum. Patron of the Holly Lodge Centre Ben Shephard said, "I became a Patron a couple of years ago after I discovered the Centre on one of my regular visits to Richmond Park. I brought my boys to an open day here and I met Pat (Ealey) who told me about the good work the Centre does and I wanted to get involved. "The Holly Lodge Centre really is a hidden gem but it shouldn't stay that way as we want as many groups as possible to come and experience a day here, it really is an inspiring and tremendous place to learn and I'm proud to be a Patron." Over the years the Holly Lodge Centre has grown and now offers outdoor experiences in the natural surroundings of the park such pond dipping, nature trails and gardening. In 2007 the addition of a Victorian Classroom, garden and Victorian Pharmacy (which was a gift from a Mortlake pharmacy) added to the Centres offering. Working with The Royal Parks, the Centre is also developing new work in Equine Assisted Learning helping young people with special needs to communicate with horses. The Royal Parks Chief Executive Linda Lennon CBE said, "It's a privilege to be here today. I'd like to congratulate Pat (Ealey), Centre Manager Anna King, the trustees and all of the volunteers for their hard work and all that they've achieved over 20 years. I know how important this Centre is and The Royal Parks are proud to have such a facility in one of our parks. I think they do a fantastic job and long may it continue." Founder and retired Richmond Park Superintendant Mike Fitt OBE said, "I came to Richmond Park in 1989-1990 and I saw school groups and children walking around the park looking a little lost, not quite knowing what they were looking at, so I had an idea - why not build an education centre so that people can learn about these things. "It took a few years of planning but in 1994 we officially opened. It has been tough along the way and I'd like to thank The Royal Parks for seeing that we had something special. It's been a wonderful experience watching it grow and seeing young lives transformed. There have been many people contribute to our success and I'd like to thank them all." The Holly Lodge Centre is running a '20th Anniversary Appeal' to raise funds to improve and increase the range of natural world activities, including wildlife habitats and a sensory room for those with learning difficulties. Call The Holly Lodge Centre on 02089408730 for more information or to make a donation.